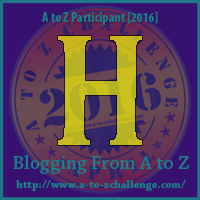 I decided to continue using the 2016 A to Z logos since I had created the pages but not the posts. I have over 20,000 people in my family tree so have lots of possibilities for posts. My Maternal Great (x3) Grandmother is Phariba Hatfield. Don't you just love that first name! So far, I haven't found any other family members with that name other than her oldest daughter. Of course, Phariba was born in 1795 so that makes records pretty scarce, especially when you are unable to travel to the family locales. I've tried to see if there was a family connection to the infamous Hatfield's of the Hatfields and McCoys, but other than that Phariba was born in Virginia, I can't make the connection. Just discovered another tree that has her birthdate as 1791 which makes more sense. Her first child was born in 1808. Looks like she had 18 children including three sets of twins. No wonder there are 139 members in her DNA Circle on Ancestry.com. Some confusion as to her date of death. Some people have it at 1840, but I found her in the 1850 census so I believe she died sometime in the 1850's since I couldn't find her in the 1860 census.